Whether you are installing a cluster box unit or a bank of 4C mailboxes, we can help you access your mailbox needs and navigate USPS and Utah requirements. Call (801) 299-0800 for a free quote or for help finding the best mailbox for your needs. Helps keep postal rates lower. Keeps mail secure from theft. Speeds up mail delivery by reducing the number of stops. Keeps packages secure when recipients are away. Does a better job at protecting packages and letters from the elements. Enhances the appearance of the neighborhood by eliminating individual curbside mailboxes. Is cheaper than installing individual mailboxes. While centralized mail delivery is efficient and attractive, it requires some additional planning. There are a number of USPS regulations that dictate where multiple mailboxes can be placed, how they are installed, and how they are constructed. In fact, mailboxes must undergo testing and meet or exceed all USPS specifications (4C mailbox standards) to be approved. Many of the standards were created so that mailboxes would stand up well to normal use and vandalism. They also take into account mail delivery efficiency and the size of mail that we normally receive. USPS approved commercial mailboxes go by many names and come in hundreds of configurations, but working with an authorized dealer like Cannon Sales will help you to select the right unit and accessories for your needs. 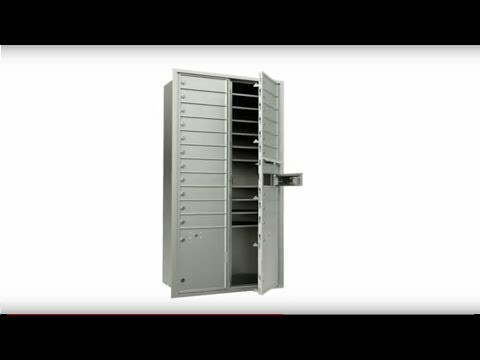 What Kind of Commercial Mailbox Do I Need? 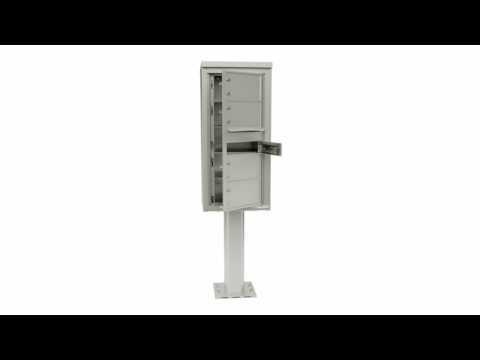 The two most common types of commercial mailboxes are the free-standing cluster mailbox unit and the wall-mounted style mailbox system referred to as the STD-4C mailbox or simply the 4C mailbox. Which type of mailbox system you need largely depends on whether you need indoor or outdoor mail delivery. Used outdoors, these cluster boxes stand on a heavy-weight pedestal and are popular in suburban residential neighborhoods, condo complexes and apartment complexes. Because of their central location, they minimize the mail carrier’s effort while increasing security. Their centralized location helps keep the mailboxes free of vandalism and tampering while the locking boxes help keep mail and packages secure from theft and even mother nature. Powder-coated finish to resist scratches, vandalism, and weather. Welded mailbox cabinet and hood seams. 300 series stainless steel and aluminum construction, including the pedestal. Front-loading mail carrier door with interlocking, overlapping seams that protect against tampering. Solid aluminum mailbox frame for increased stability and security. Four color options: black, dark bronze, sandstone, and postal gray. 4C mailboxes are used mostly indoors and can be recess-mounted or surface-mounted and even placed on pedestals. An attractive option for apartment buildings and office buildings, our line of 4C mailboxes are USPS approved. Wall-mounted cluster boxes are also designed to meet ADA Fair Housing requirements. Heavy-duty 300 series stainless steel components for durability in indoor and outdoor mail delivery applications. Solid aluminum mail slot for secure mail collection and delivery. Double-locking parcel box system for enhanced package security. New USPS-1172 910A locks with three keys per customer mailbox. Optional recessed and flush mounting options. 140 design configurations to meet all types of needs while remaining USPS and ADA compliant. Multi-unit connector for a finished, gap-free installation. Horizontal, vertical, and large compartment configurations available. For private mail delivery, such as inside offices, dormitories, and more, we offer Florence commercial mailboxes with rear-loading features. These recess-mounted mailbox systems provide a convenient way to distribute mail when meeting USPS requirements isn’t necessary. Open rear cabinets for quick sorting. 5-pin cylinder cam lock with two tenant keys. Number markers front and back. Snap-on outer trim kits, optional. Does My Mailbox Need to Meet USPS or ADA Standards? The U.S. Postal Service must approve mailbox designs, but they aren’t the only authority to consider. Some cluster units must also comply with ADA or FHA guidelines, or both. Florence mailboxes come in a variety of configurations to be compliant with each of these governing bodies. Cannon can guide you in selecting the right commercial mailbox solution for your building’s practical, aesthetic, and compliance needs.